According to a 2013 Workplace Safety Index report published by Liberty Mutual, slips and falls are the second leading cause of losses due to death, personal injury and suffering, workers’ compensation, loss in productivity, and civil liability in both the workplace and public environments, behind overexertion injuries. With direct costs of $8.6 billion, this category of injury accounted for 15.4 percent of the total injury burden in 2011. The National Safety Council (NSC) estimates that workers’ compensation and medical costs associated with worker slip and fall accidents are approximately $70 billion per year. Liberty Mutual indicates that the challenge is far from under control and actually keeps growing. The costs associated with fall-related injuries have grown 25.6 percent between 2005 and 2013. On average, workers who are injured as a result of a slip and fall accident spend more days away from work (median: 8 days) than those who are injured as a result of other causes. Even more alarming is that nearly 30 percent of same-level falls result in more than 21 workdays lost. Worse yet, the NSC reports that slips and falls are the leading cause of death in the workplace, and the cause of more than 20 percent of all disabling injuries. 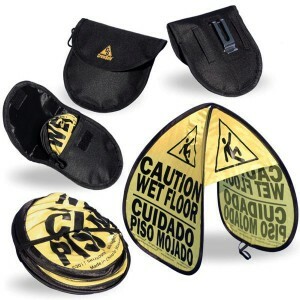 The slip and fall challenge cuts across many industries. When we were approached by HMS Host, the world’s largest provider of food, beverage and retail services for airports and travelers, we weren’t surprised. HMS Host asked us to develop an innovative solution that would help to minimize the slip and fall hazards found at their airports. Develop a first-response, real-time hazard warning solution to minimize potential slip and fall hazards. Client feedback and team brainstorming sessions provided the conceptual pool we needed to find the end result. Soon after honing in on the most promising idea, we had a conceptual product designed that met all client and marketplace criteria. Prototypes were made and tested shortly thereafter. With minor design enhancements and prototyping completed, and client sign-offs in hand, we proceeded to manufacture the hazard warning product we named the big MINI. The development of the big MINI hazard warning sign allows workers to instantly mark a spill with caution signage without having to leave it unattended while they retrieve their cleaning supplies. The signs are worn by the end user in a small personal carrying case that can be attached to a belt or a pants or clothing pocket that is easily accessible. With the average slip and fall incident costing an estimated $28,000, it doesn’t take long for the elimination of just one of these losses to pay for the investment of the big MINI hazard sign solution for thousands of airports and other publicly-served locations.